Kathmandu, Tribhuvan International Airport (TIA): Distance to the center of Kathmandu is approximately 20 minutes by car. During daylight savings time it’s 4 hours and 45 minutes later in Nepal. During the winter it’s 5 hours and 45 minutes later in Nepal. The Nepali Rupee (NRS). 100 NRS is ± 1 Euro. Mineral water, purified water and soft drinks purchased with sealed bottles are safe. The food is reliably safe in most tourist areas. Traveler’s diarrhea is common, but you can reduce the chances of this. 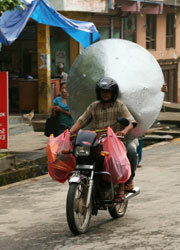 Purchasing food from street vendors is risky! Be sure to clean fruits and vegetables from the local markets well and boil them if possible. Inquire with your doctor or clinic. Some doctors recommend taking malaria pills during certain times of the year when visiting the lower lying areas like Chitwan National Park. 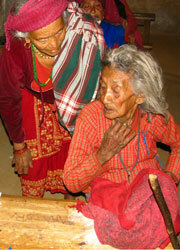 Pure Nepal always encourages guests to obtain good travel and health insurance in their home country. Experience has shown this to be the best option. However, Pure Nepal can assist you should you wish to purchase insurance in Nepal. Costs incurred due to illness or emergencies cannot be recovered from Pure Nepal. Like any other developing country, you will encounter beggars in Nepal. This can be shocking. No matter how good your intentions may be, when you reward begging you ensure that it continues in the city. Begging even keeps children from going to school. If you’d like to give a gift that will really help people, make a donation to an organization in Nepal that helps improve living conditions, healthcare or education. Sit on the left side of the plane during your flight to Nepal: Magnificent views of the Himalayas in clear weather! Nepali is the official language of Nepal and is spoken by the majority of its people. English is also widely spoken and you can get by using it in many areas. It’s just plain fun for people who love languages! How are you? Sanchai chha? Dutch – English – Nepali. Fill in your contact information and we’ll send you an e-mail with a link to the free Pure Nepal language guide!